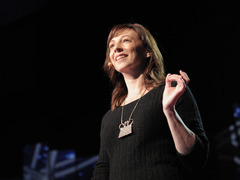 At TED2012, Susan Cain asked us to stop the madness. That is: the group work madness. At offices and schools around the globe, the desire for collaboration has led to an onslaught of open floor plans and group projects where individuals aren’t given much space to think on their own. And this is a big problem, Cain explained, because a third to half of people in the world are introverts. They thrive on their own and feel at their best in quiet moments, without over-stimulation. While our culture tends to laud extroverts — people who are outgoing, social and high on charisma — Cain stood up for the introverts of the world in her talk. In the past year, Cain’s talk has been viewed nearly 4 million times. Meanwhile, her book Quiet: The Power of Introverts in a World that Can’t Stop Talking became a New York Times bestseller. With the paperback of the book now on bookstore shelves, the TED Blog spoke — softly — to Cain about the experience of the past year. Do you feel like Quiet has made a dent in the cultural bias toward extroversion? Yes, and it started within minutes of giving my TED talk! One member of the audience was Jim Hackett, the CEO of Steelcase — a self-identified introvert and just a lovely fellow. He told me he’d been thinking for years about ways to encourage employee privacy at work. His company has spent the last year working on this question. And Herman Miller, the office furniture manufacturer, is following the same path. Since then, I’ve heard from other businesses who are using the ideas in Quiet to rethink their corporate culture, and from schools asking their teachers to read the book and question practices like grading children on class participation. I’ve also heard many stories of individuals empowered by the message of the book. Just last night, I met a lovely young woman who said she’d always wanted to be an entrepreneur but was afraid she was too quiet to pull it off. But after she saw my TED talk, she started her own company. What are some of the most basic things we can do in schools and offices to make sure introverts are in their element and that their voices get heard? In workplaces, we need to dramatically rethink open office design. These spaces are so economical that I don’t expect them to disappear, but they desperately need to be balanced with private nooks and crannies. Also, it’s fine to organize people into teams, but that doesn’t mean the actual work has to get done collectively. Most people think better when they’re on their own and not subject to constant interruption and scrutiny. In schools, I am just going to repeat what I said in my TED talk, almost a year ago now: stop the madness for constant groupwork. Constant groupwork is even bad for extroverted kids. According to psychologist Anders Ericsson’s research on how people become stars, excellence depends not on talent but on sustained, deliberate practice that is often conducted in solitude. Now that you’ve been speaking about this book for a year, do you feel any more extroverted? No way! Yes, I’m more comfortable giving speeches than I used to be. Yes, I feel lucky and grateful to connect with so many great audiences. But I will always feel most at peace when I’m home with my family, or lounging around a café with my laptop and a latte in hand. If you were starting over in writing this book today, what would you include that wasn’t in the original text? I wouldn’t change much about the book. But I wish I’d had reader resources ready and waiting to go, at publication date. Every day, teachers and businesspeople ask me for tools they can use to harness the talents of the introverts in their lives. And regular people ask me for help with dating, schmoozing, public speaking and career choices. Right now I’m developing an online course in public speaking for introverts. And I’m planning a young-adult version of Quiet. But there’s so much more to do. The truth is, this is a job not for one person but for hundreds, thousands, maybe millions. Luckily, many other people have started to write about and work on these issues, too. (I’ve listed some of them in the “Resources” area of my website.) There truly is a Quiet Revolution afoot. I really hope that people reading this will think about the places in your own world that you’re in a position to influence. Is there anything new that readers will find in the paperback? Yes, lots of stuff. The paperback now opens with my 10-point manifesto for introverts. And in the back of the book, there’s a new reader’s guide, list of introverts in literature, and other resources — tips on public speaking for introverts, tips for parenting an introverted child. Also, tips for educators. As someone who is at the far side of extrovert (I describe mysef as an 80/20 extrovert), having watched this superbly enlightening piece by S Cain, I feel envious of those who are internally validated/self sufficient/self referencing, where most of my validation comes from external sources (aka other people!) which means I choose to spend most of my time in the company of friends, colleagues and strangers! I am energised by spending most of my time in the company of others which can be an exhausting, full-time job! I was amazed to find that when I looked and questioned my friends and family, I have less than 10% extroverts in my circle – one of my most introverted friends (he is a 5/95!) describes people as either drains or radiators! I feel it is too much of a coincidence and believe I am naturally drawn to those who are calm and introverted. A fascination topic. The only thing I am disappointed in is that it took me more than two years to discover this TED talk by Cain! I have been in medical sales for 32 years winning several awards and people assume I must be extroverted. The truth is, I thrive on one on one, which is the typical selling environment. In large groups, I find myself disappearing and not able to stand up to domineering types that inevitable take over in group work. I get depressed and frustrated in those situations. Now I understand that it can make sense to be introverted, yet praised for outstanding social and communication skills as part of customer service. I do my best preparing and thinking alone, but I do enjoy the sharing of ideas in teaching environments. I just prefer not to have to do group work! Its low, gets bogged down, and ultimately stifles me. Thank you, Susan Cain, for writing Quiet: The Power of Introverts in a World That Can’t Stop Talking! As an introvert who has always been regarded as not only quiet, but also timid and weak, this book is very refreshing. It puts into words what many introverts know intuitively; strength does not have to be loud, in your face, or aggressive. Strength and conviction can present themselves quietly without sacrificing effectiveness. Through impressive research, Ms. Cain clearly demonstrates the importance of both personality types and the value of introversion. I only wish that I could have read this book when I was younger so that I would have been more confident and accepting of my own nature. After reading it now, I do feel that I can better articulate the importance of my role in society and take pride in the contributions that introverts have made throughout history. Thank you for doing what you do Ms. Cain. As a Martial Arts practitioner, I am aware of valuable practice in solitude. I hope to get a hold of your book soon.